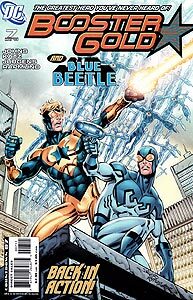 Cover Description: Booster Gold and Blue Beetle II pose on a rooftop while a swarm of OMACs fill the sky. Brief Synopsis: Booster Gold and Blue Beetle II find themselves trapped in an alternate present facing the dire consequences of their actions. Issue Notes: According to the cover, this issue was published the same week as Countdown #7. ...the Blue Beetle's Bug. Or at least one of them. Beetle later mentions that he lost two Bugs during the events of Countdown to Infinite Crisis. 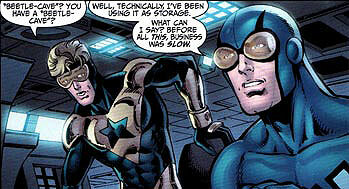 The Bug in this panel, later identified as "the Bug [Ted] kept in a subbasement under Kord Industries...in [Ted's] Beetle-Cave," looks identical to the Bug commonly seen in Blue Beetle, Vol. 1 (as seen on the cover of Booster Gold, Vol. 1, #22). This Bug has a solid, unsegmented body with pointed "legs." As Beetle camouflages the Bug to avoid the OMAC Units, the OMAC's speech paraphrases dialogue featured in the movie Star Wars when Obi-Wan Kinobi fools soldiers into allowing him safe passage with a "Jedi Mind Trick." Oddly, in this panel the Bug airship clearly has a segmented head and clawed feet. This Bug appears more like the bug seen in the aforementioned Countdown to Infinite Crisis. Now the Bug appears to have a shrunken head and forelimbs. This is most similar to how the Bug appeared in its earliest Charleton comic book appearances and Jurgens' "re-design" in Justice League America #63. Beetle comment about "London Calling" is likely an intentional reference to the classic title-track from the Clash's 1979 London Calling rock album. In his second musical reference in as many pages, Beetle mentions "The Way We Were," a Barbara Streisand song from the movie and album of the same name, in retaliation for Booster's sudden, exposition-laden recap of historical events. Entering the old Justice League International London Embassy (now a museum), Booster is attacked by a one-eyed tabby cat once befriended by his Justice League teammate Power Girl. Booster has actually met the cat only once before, in Justice League Europe #49. Catherine Cobert, one-time liaison for the Justice League International threatens Booster and Beetle with a shotgun. Booster's first meeting with Cobert in Justice League International #8 was a long-time embarrassment for him. The statues that the OMAC's blast destroys depict G'Nort, Blue Jay, and Silver Sorceress, all former affiliates (and part-time members) of the Justice League International. SCHOOL'S OUT: The villains manipulating events behind the scenes are using a chalkboard similar to Hunter's. However, the villains are much less cryptic in their musings. Boosterrific Review: Of course the hopeful events of the rescue of Blue Beetle were too good to be true, and Booster Gold finds himself responsible for exactly the catastrophe he is pledged to prevent. Having previously explored alternate history, writer Geoff Johns now takes the opportunity to investigate alternate presents. In the Silver and Bronze Ages, this sort of story used to be the bread and butter of many a comic taking place in the DC Multiverse. Longtime DC fans will no doubt relish its return. At the worst, new fans are introduced to the familiar (and long missed) antics of Blue and Gold. Though this issue doesn't sparkle quite with the same level of intangible "wow" factor magically included in many of its predecessors, it is still a very good comic book and worth a read. Blue and Gold is always good, though as I recall, things, story in particular, started getting a bit haywire with this issue. Interesting issue and fun. Blue and Gold back together and is that a Catherine Corbet cameo? People we have not seen in years for 800 Alex. And as long as we are on the subject....bring back Trixie Collins!